People often say that stock charts are fractal. Not only are there repeating patterns, but they echo across different time scales like themes in a fugue. It is a truism that you can’t tell a daily chart from an hourly one without looking at the scale. These properties of self-similarity and scale invariance are pretty important, and you would think that somebody would have found a way to use them for trading. I haven’t, but I figured that computing the Hausdorff dimension would be a good place to start. I am referring to the seminal paper by Benoit Mandelbrot, How Long is the Coast of Britain? The idea is, if you take your yardstick into every cove and inlet, the length of the seacoast gets longer as your precision increases. 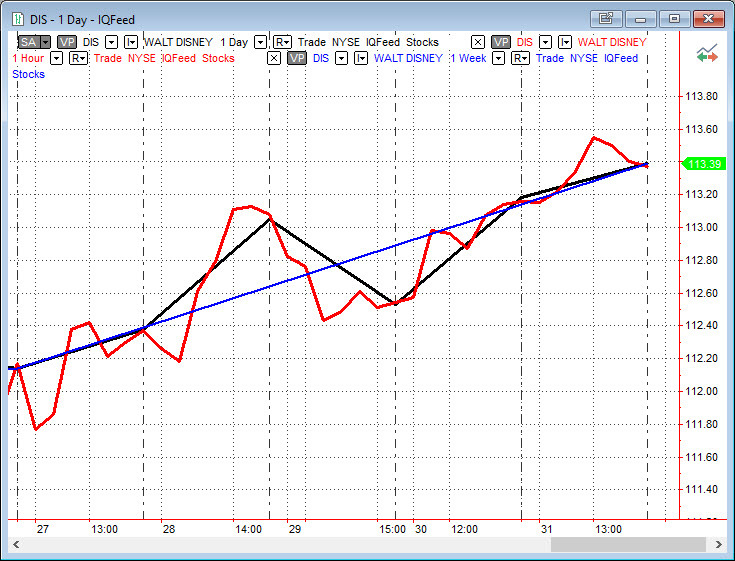 To show how this applies to stocks, I made a line chart of Disney’s daily, weekly, and hourly closes. The weekly line is the shortest. Price increases by $1.20 in a straight line. The daily line has five segments with total up and down travel of $2.30. The hourly line zigzags up and down for $5.00. All three lines cover the same span, but the distance is longer for the shorter scales. 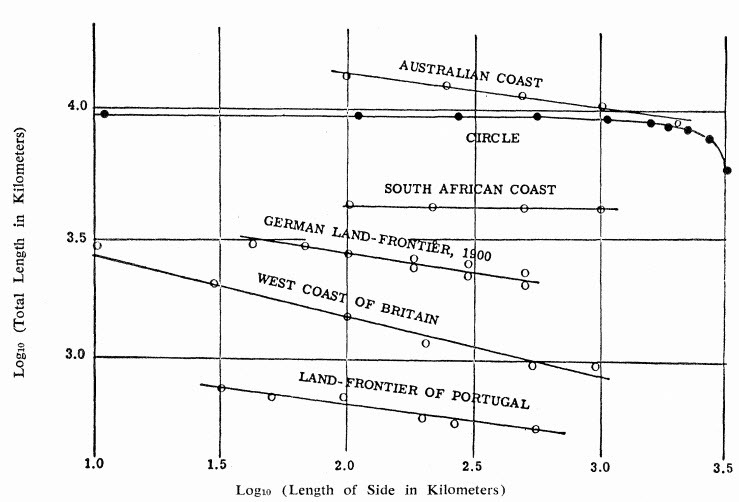 Richardson showed that for seacoasts the length is described by a power law relation with the scale of measurement. The model breaks down a little for stock charts if you try to compute the segment lengths using the Pythagorean Theorem, because you have time units on one leg and price on the other. I decided to use only the price movements. This gives an exponent of -0.40, which Mandelbrot would call a fractional dimension of 1.40. A straight line, of course, has a dimension of 1, a plane has 2, and a jagged line is somewhere in between – the more jagged, the higher the number. Going forward, I will call it 40, taking advantage of the natural bounds to normalize in the range 0-99. Combining daily, weekly, and hourly results seems natural enough but it only gives me three points. So, I used a year of daily data with intervals of 1, 5, 10, 25, 50, 125, and 250. 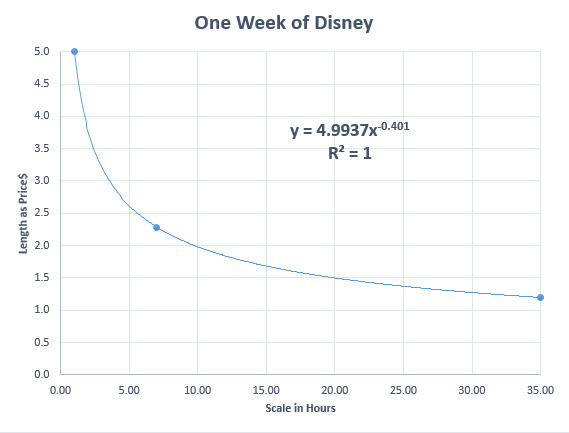 This gave me a reading of 75 for Disney and 56 for Apple. While we expect statistical self-similarity, it appears that some patches of our figurative “coastline” are more rugged than others. This suggests the opportunity for an indicator, like Bollinger Bands. 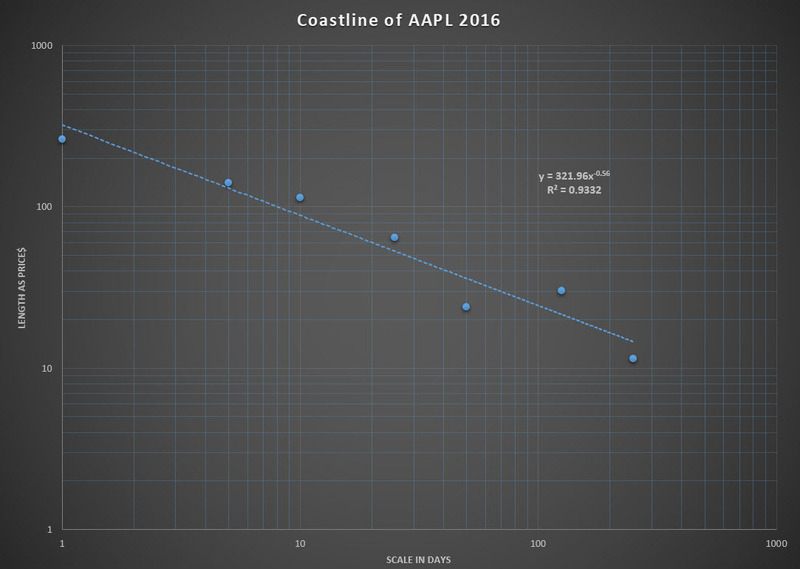 Next, using data in minutes, I plotted the figures for three days of Apple, June 1-3, 2016. The three days have readings of 81, 72, and 77, consecutively. Here are the charts, side by side. See if you can tell the difference. An indicator based on this theory would be a nice way to show the effect of higher time scales, like Carter’s “combo wave” indicator. If I come up with one, I’ll publish it here.